3.02pm – Proceedings temporarily adjourn to allow Najib’s defence team to get the necessary documentation to properly cross-examine the prosecution’s second witness, Azizul Adzani Abdul Ghafar. The accused’s counsel Harvinderjit Singh says their documentation was a bit “jumbled up” while the prosecution’s one was better arranged. High Court judge Mohd Nazlan Mohd Ghazali then allows the temporary adjournment. Earlier during examination-in-chief by DPP Suhaimi Ibrahim, Azizul said he handed over the confiscation list (senarai geledah) and related documents to Bank Negara investigation officer on July 7, 2015. This is a day after Azizul carried out a raid at an Ambank branch at Raja Chulan, KL, whereby he confiscated documents on the opening of bank accounts by Najib, SRC International and Gandingan Mentari. 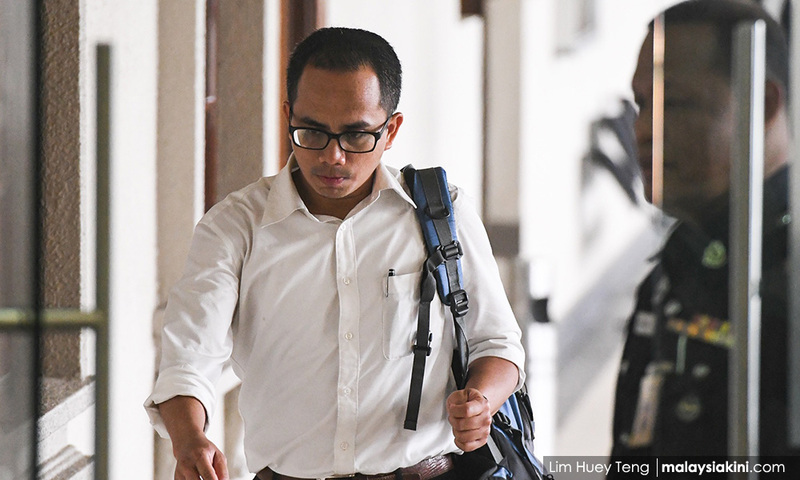 2.40pm – Proceedings resume with DPP Suhaimi Ibrahim continuing his examination-in-chief of the second prosecution witness, Bank Negara investigation officer Azizul Adzani Abdul Ghafar. 12.45pm – The second prosecution witness, Bank Negara investigative officer Azizul Adzani Abdul Ghafar testifies that he took part in a raid on an Ambank branch at Jalan Raja Chulan, Kuala Lumpur, on July 6, 2015. During examination-in-chief by DPP Suhaimi Ibrahim, the 41-year-old said that he was the raiding officer during the raid, which netted eight sets of documents related to the account openings by the accused Najib Abdul Razak, SRC International, and Gandingan Mentari. Suhaimi: what were you investigating on July 6, 2015? Azizul: I was appointed as the raiding officer by (Bank Negara’s) investigating officer Farhan Shahrudin over suspected offences committed under AMLA (the Anti-Money Laundering Act). Suhaimi: Where did you conduct the raid? Azizul: At an Ambank branch at Raja Chulan, KL. Suhaimi: Why were you ordered to carry out the raid at Ambank? Azizul: To aid investigation under AMLA based on a report. I went with three other Bank Negara officers. Suhaimi: Who did you meet at the Ambank branch? Azizul: I met R Uma Devi, the manager of the Ambank branch at Raja Chulan. I informed Uma Devi orally of the list of accounts that are sought for a probe by Bank Negara. She then came back with several troves of the documents. Suhaimi: Then what else did you do? When Suhaimi asked how many sets of documents were seized, Azizul said there are four sets of documents, which dealt with bank account openings from 2011 to 2015, involving Najib, three linked to SRC International and one involving Gandingan Mentari. Najib’s counsel Harvinderjit Singh applied for a short recess to allow the defence to go through the sets of documents. High Court Mohd Nazlan Mohd Ghazali allowed the application and fixed 2.30pm for proceedings. 12.30pm – Akmaludin, is released from the witness stand after cross-examination and re-examination. The prosecution calls its second prosecution witness, Azizul Adzani Abdul Ghafar, who is an executive at Bank Negara Malaysia. Azizul was part of the Bank Negara team which raided the Jalan Raja Chulan Ambank branch in the capital in 2015. 12.15pm – Companies Commission of Malaysia (SSM) assistant registrar Muhamad Akmaludin Abdullah testified that his knowledge on the companies registered with the commission is only based on what he had seen in their documentation. During re-examination by DPP Suhaimi Ibrahim, the first prosecution witness said that as a result, he does not have personal and specific knowledge on the nature and activities of company filings with SSM. Suhaimi: How many companies have been registered with SSM (since the witness began working with SSM)? Suhaimi: Do you have specific information and knowledge on the companies registered with SSM? Suhami: In your statements today (during cross-examination by Najib Abdul Razak’s counsel Harvinderjit Singh), it is not from your own knowledge but based on what was stated in the documents (filed with SSM)? Earlier, during Harvinderjit’s cross-examination, Akmaludin gave a series of answers that alternated between “Yes” and “I do not know” in regards to filings by SRC International with SSM. Harvinderjit’s line of questioning focused on SSM filings by SRC International, which seemed to show a delay in their filing whereby the date of the documents are at least a month from when they were filed with SSM. Among the questions are in those in regard to a purported discrepancy over filings relating to an alleged 2015 meeting by SRC International’s board of directors which led to the transfer of 999,998 shares from the company to 1MDB Energy. Harvinderjit contends that the defence’ stance is that there os no such resolution by the company dated August 2015, among others. 12.10pm – Proceedings resume with DPP Suhaimi Ibrahim continuing his examination-in-chief of the second prosecution witness, Bank Negara investigation officer, Azizul Adzani Abdul Ghafar. 11.13am – The proceedings stop for a short break after Muhamad Akmaludin Abdullah is cross-examined by Najib’s counsel Harvinderjit Singh. Harvinderjit had questioned the witness on the apparent incongruity of 999,998 SRC International shares being transferred to 1MDB Energy a few months before documents were received by the Companies Commission in August 2011. 9.43am – Proceedings resume, with deputy public prosecutor V Sithamabaram informing the court that the prosecution has no objection to the defence’s application to view the three documents related to SRC International. Muhamad Akmaludin Abdullah takes the stand again to face cross-examination by Najib’s counsel Harvinderjit Singh.